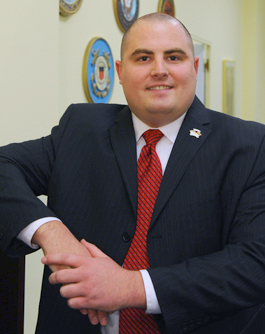 Adam Anicich is the deputy director of the Congressional Liaison Service for the Department of Veterans Affairs (VA). In this role, he is responsible for the Senate liaison office and is collocated with the Senate in the Russell Senate Office Building. Adam, a disabled combat veteran of the US Army, and his team communicate the Department's initiatives to members of Congress, provide information on all programs and services the VA provides, annually receive and resolve more than 21,000 Congressional Inquiries dealing from casework to policy, and act as on-site liaisons between 541 members of Congress and the VA. Prior to his appointment with the VA, Adam worked in leadership positions for the Department of Commerce, Missile Defense Agency, and he spent six years in the private sector at a number of southern California banks. Adam received a B.A. and M.B.A. from Saint Leo University, and is currently finishing a Doctorate in Management at the University of Maryland. As a former Army Sergeant and polytrauma patient, Adam is uniquely qualified to identify and communicate the needs of the department and veterans to Congress.